DGM India has sold three folder-gluers at the PrintPack India 2019 exhibition. While Hyderabad-based Pragati bought the SmartFold 1100PC folder-gluer, Kolkata-based Sattik Packaging and Delhi-based Packmaax India inked the deal for Megafold 2400 and SmartFold 1100SL respectively. For Sattik Packaging, which also makes 3- and 5-ply boxes, this is the second folder-gluer from DGM. 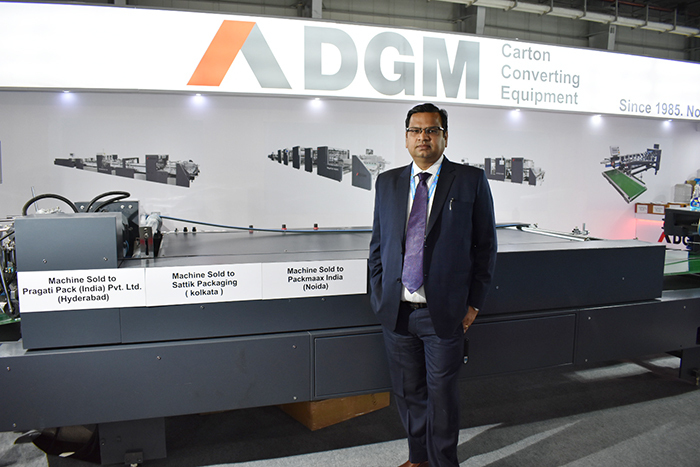 Puneet Aggarwal, MD of DGM India, revealed that by the time the PrintPack exhibition concludes, the count of DGM machines sold over last four months in India will go up to more than 10. A stellar salesman who has his fingers on the pulse of the Indian market, Aggarwal joined as managing director of DGM India in November 2018. Aggarwal revealed that by the time the PrintPack exhibition concludes, the count of DGM machines sold over last four months in India will go up to more than 10. A stellar salesman who has his fingers on the pulse of the Indian market, Aggarwal joined as managing director of DGM India in November 2018. DGM is a 35 year old company based in Huizhou city, China, manufacturing diecutters, hot foil stamping machines, folder-gluers and flute laminators. The company also manufactures folder-gluers for 5-ply boards. DGM manufactures over 350 machines every year out of which 40% is exported to different countries. In 2018, DGM decided to enter the India market as a direct subsidiary, and appointing Aggarwal as their MD is DGM’s first step toward achieving this goal. The new office, expected to be in operation by April 2019, will be based in Noida. Aggarwal shared that the new DGM India office will also have a demo center. “For after-sales service, DGM India has partnered with Chennai-based PrintPack Technology. The service team of PrintPack Technology is capable of handling any critical issues as they know these machines inside-out,” says Puneet Aggarwal. For after-sales service, DGM India has partnered with Chennai-based PrintPack Technology. “India is a service-sensitive market – so providing flawless service to our customers is our first priority. That is why we did not tie up with any new service providers but with someone who is in this industry for more than 25 years with vast experience and expertise. The service team of PrintPack Technology is capable of handling any critical issues as they know these machines inside-out,” concluded Aggarwal.